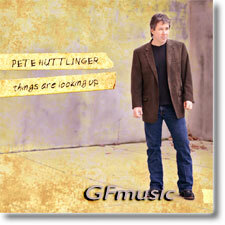 Pete is back with another great CD, and it just might be his best yet! Beautifully recorded, his guitar has never sounded betterhis playing crystal clear and filled with emotion. This latest release finds Pete playing his signature solo guitar magic on five tracks, and backed in varying degrees by bass, keyboards, drums and dobro on ten more tracks. On solo guitar, Pete offers stellar arrangements of John Mayer's No Such Thing, George Harrison's While My Guitar Gently Weeps,and A.C. Jobim's A Felicidade, The remaining 12 tracks are Huttlinger originals, and Pete's writing reaches a new high with this release. The View and The Small Stuff are wonderful solos, and when his band joins in, Pete really shines! A seasoned Nashville session player, Pete really knows the territory, and these tracks are a musical delight. Guitarists will be happy to know that Pete is planning a companion Music/TAB book in the near future. Very Highly Recommended! One of Pete's most popular CDs, featuring incredible solo guitar arrangements of Stevie Wonder's "Superstition," Bobby Hebb's "Sunny," and Gershwin's "I Got Rhythm," plus nine original Huttlinger tunes that cover a wide range of styles and moods. 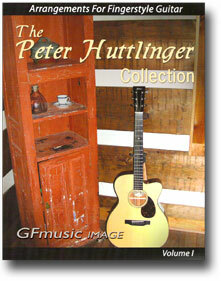 Includes "Tommy in the Morning," written for Tommy Emmanuel. Here's the best newsPete has personally transcribed the entire album, along with a dozen more tunes from Naked Pop and Catch & Release in his book The Peter Huttlinger Collection, listed below. Highly Recommended! 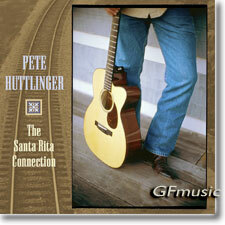 This ambitious 148-page book contains Pete Huttlinger's arrangements drawn from his Catch & Release and Naked Pop CDs, as well as EVERY track from his popular Santa Rita Connection CD. 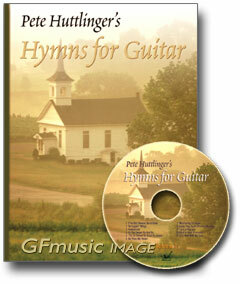 At his concerts, Pete often receives requests to perform guitar arrangements of popular hymns. Over the years, he has crafted several exciting and varied arrangements of these treasured melodies, and offers his favorites here in this new Book/CD set. The pieces range from intermediate to advanced, and include nine solos and two duets. Pete calls on a variety of influences: you'll hear touches of James Taylor and Merle Travis, with styles ranging from Celtic to even Bossa Nova on one track. Published in standard music notation and TAB with Pete performing each tune on the companion CD. Recommended.